Salt Free Water Softeners — Do They Really work? 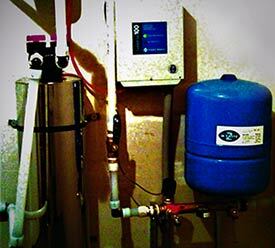 There has been much written about salt-free water softeners. In reality, there is no such thing as a salt free water softener. The process of “softening” is a chemical substitution of a “soft” mineral (sodium or potassium) for a hard one (calcium or magnesium). The chemical substitution substitutes minerals that do not attach themselves to plumbing, heating elements, soap and other surfaces producing largely more desirable characteristics of water than “hard” water. Very few people dispute the fact that while most of the characteristics of “softened” water are more desirable for household or industrial use, the side effects the softening process are much less desirable for human, animal or plant consumption. The adverse affects to the environment have become a major issue with many municipalities banning the use of salt-based water softeners. Salt is a proven technology with predictable results. Most people would prefer not to use salt, but see no viable proven alternative to produce equivalent results. We are assuming you have come to this site because you are interested in technology that does not use salt (either sodium or potassium based). The marketing of many devices that have no basis in logic and no proven effectiveness has tainted the entire industry. We do not wish to engage in a debate about the effectiveness of any particular device. We are only concerned with technologies that work, and have been proven in independent lab tests to work. Many products cite the WQA Gold seal, but the fact is that the Gold seal only means that the product will not poison you, it makes no representation as to the effectiveness of the product. (By the way, our products also carry the WQA Gold Seal). Sadly, in the USA, there is no standard to which a scale preventer or water softener must work to be sold despite the requirement by a growing number of municipalities that salt based softeners cannot be used. The only real standard of effectiveness are independent tests measuring scale prevention properties of these types of devices. We are not saying any particular device does or does not work, but if you have a device that really works, why not request to see an independent test results showing how effective the unit is at scale prevention? Any consumer who would buy a device not independently tested should not be surprised if the device is not effective. The typical standard of TDS (Total Dissolved Solids) has very little relevance with respect to an effective salt-free scale preventer as no minerals are actually removed from the water. 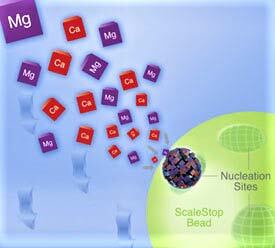 The secret of a real working salt-free water softener (scale preventer) is not to remove calcium or magnesium which are both beneficial elements to human, animal and plant consumption, but to bind them in a form where they do not attach to plumbing, soaps or detergents, or any other item through which water flows. A specially designed membrane actually provides a template for the crystallization of undesirable elements present in the water and then releases seed crystals, which further bind free calcium and magnesium to them, including those already present in the plumbing. Crystal formation – Atomic sized nucleation sites on the surface of small ceramic-polymer beads convert dissolved hardness into microscopic crystals. Crystal Release & Re-grow – Once the crystals grow to a certain size they are released from the bead. The crystals in solution keep the hardness out of the water so that it can’t form scale or interfere with soap. To our knowledge, there are only 3 products on the market that actually work, and hundreds that do not work. The product we offer at Pure Water, the Nano Soft Salt Free Softener / Conditioner, is the lowest priced and has the best warranty of any available salt free water softener that is certified to be effective.